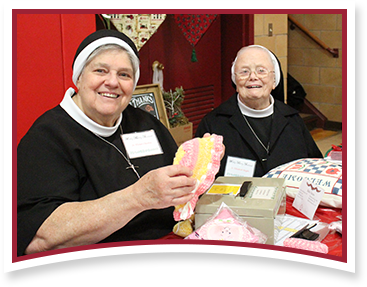 The annual Holly Berry Festival, a juried craft fair to benefit the Apostles of the Sacred Heart of Jesus Retirement Fund, occurs each year on the Friday and Saturday before Thanksgiving. If you are a crafter interested in participating in the 2018 Holly Berry Festival on November 16 and 17, please download and complete our Craft Fair Application. Friday, November 16 from 3:00 p.m. to 8:00 p.m. Baked Ziti Dinner 5:00–7:00 p.m.
Saturday, November 17 from 10:00 a.m. to 3:00 p.m.